Quentin Tarantino finally has his Once Upon a Time movie. You knew it was bound to happen. I honestly expected it to be a western, but as he’s done that the last two times out of the gate, I guess that wasn’t in the cards. 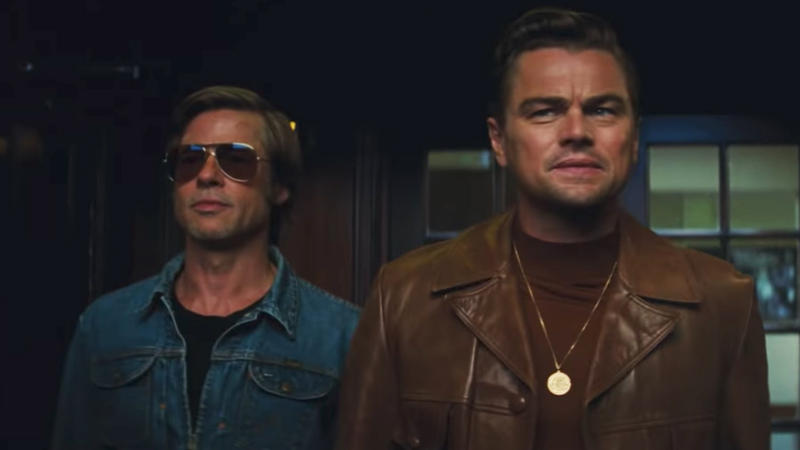 As you might imagine, some folks are frothing over at the prospect of a new QT movie, so without further ado, here’s the first trailer for Once Upon a Time in Hollywood. All your favorite Tarantino-isms are present and accounted for in this Once Upon a Time Trailer. We’ve got quippy, clever banter; a who’s who of celebs; throwback dancing (though period-appropriate in this instance); a throwback studio logo; curious stylistic flourishes; lots of posing; cool cats being cool; propulsive, deep-cut, oft-forgotten minor hits that will inexplicably become popular after this (“Straight Shooter” by The Mamas and the Pappas and “Bring a Little Lovin’” by Los Bravos in this case), and more. ONCE UPON A TIME IN HOLLYWOOD visits 1969 Los Angeles, where everything is changing, as TV star Rick Dalton (Leonardo DiCaprio) and his longtime stunt double Cliff Booth (Brad Pitt) make their way around an industry they hardly recognize anymore. The ninth film from the writer-director features a large ensemble cast and multiple storylines in a tribute to the final moments of Hollywood’s golden age. While the specifics are still under wraps, we also know Once Upon a Time in Hollywood involves the Manson Murders—Margot Robbie plays Sharon Tate. Lots of folks are curious to see how tactfully, or not, the Pulp Fiction director handles that very real bit of unpleasantness. As expected, Tarantino assembled a bonkers cast. In addition to DiCaprio, Pitt, and Robbie, we’ll see Al Pacino, Bruce Dern, Kurt Russell, Timothy Olyphant, Tim Roth, Michael Madsen, Luke Perry (in his final role), Dakota Fanning, and a crap ton more. Basically, everyone we lay eyes on is probably going to be famous in some capacity. It also features version of stars like Steve McQueen (Damien Lewis) and Bruce Lee (Mike Moh), who we see here. Once Upon a Time in Hollywood was originally slated to open August 9, coinciding with the 50th anniversary of the Tate-LaBianca Murders. That choice raised more than a few eyebrows, rightfully so, and the release was ultimately moved to July 26.